Hudson’s RapidPick™ Colony Picking Systems are the only fully automated high-throughput colony picking workcells, that deliver performance and precision unparalleled in the Life Science industry. In addition to allowing researchers to automate the selection and growth of cells grown on a colony plate, it will also retain a record and image of the specific colony and which culture plate/well it inoculated. It provides the users an indispensable, unbroken data path from original colony to final result, eg. tracking a clone to a specific expressed protein. The RapidPick series of multi-pin colony picking systems include the RapidPick Basic, RapidPickComplete, RapidPick Lite and RapidPick ACIS. They offer the highest-throughput automated colony-picking solutions available today. The RapidPick SP400 is a single-pin pin for users who need RapidPick accuracy, but only require modest throughput. Hudson’s RapidPick™ systems are designed to pick from SBS-compatible omni-trays, segmented colony plates, 24-well, 96-well and 384-well plates and petri dishes. They will inoculate SBS-compatible omni-trays, 24-well, 96-well and 384-well deepwell and standard height plates. The RapidPick Complete, RapidPick Lite and RapidPick ACIS are fully-integrated solutions for colony picking, and include Hudson’s PlateCrane robot arm and stackers. The PlateCrane can be configured with 2 to 10 stacks. The RapidPick Complete also includes a full enclosure and an integrated adhesive plate sealer and media dispenser, to assure protection from outside contaminants. All RapidPick operations are controlled from Hudson’s powerful SoftLinx™ easy-to-use scheduling software. Basic: Automated, multi-pin colony picker with manually loaded source and destination plates. Lite: Includes the Basic module, plus adds Hudson’s PlateCrane robot arm plus 5 plate stacks for automated source and destination plate loading. Complete: Adds robotic media dispensing and adhesive plate sealer, in a stand alone enclosure with optional UV and HEPA filtration. 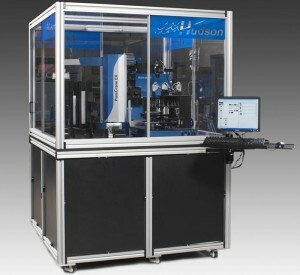 ASIC: Adds Liconic automated shaking incubator to the RapidPick Lite or Complete. SP400: Single-pin version, with the same user features and accuracy as all RapidPick platforms. In this video, the rapid pick is selecting appropriate colonies and inoculating cultures in deep-well plates. The PlateCrane will then take the culture plate to be sealed for incubation. Automated Media Filling: Eliminates the need to dispense media at a separate workstation. The Microx10′s features make it a perfect match for this application. NO Check Valves: There is only 1 moving part in the micro10 fluid path, a ceramic piston. Check valves do fail and cause mis-dispensing. Incubation: Several Automated Incubators are compatible with the RapidPick, with an integrated incubator; colonies trays can be monitored for optimum colony size prior to the start of the picking process. Additionally, when optimum conditions are met, the incubator can be cooled and humidity controlled to prevent overgrowth and condensation. Includes media dispenser for fresh growth media in every plate (Complete and ACISmodels only, optional on Lite). Integrated gas-permeable seal applicator to insure freedom from contamination (Completeand ACIS models only, optional on Lite).